Wake up everyday in your dream home, your very own sanctuary of privacy and ease. 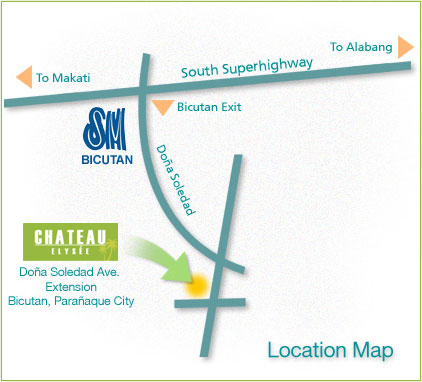 Chateau Elysée in the heart of Bicutan, Parañaque City, just 20 minutes away from the Makati Business District, and 15 minutes away from the International Airport, with shopping, dining and entertainment destinations of SM Bicutan just 10 minutes away. Built in an enchanting French Mediterranean design, Chateau Elysée sprawls on 4.8 hectares of prime land, with more than half of the property devoted to amenities and breathing space, and a clubhouse with complete facilities. Every living space at Chateau Elysée is masterfully designed - from the living room to the kitchen. Our One-, Two- and Three-Bedroom units evoke comfortable living and freedom of space. High ceilings create a sense of airy openness. Wide windows look out across pleasant bright expanses of gardens and courtyards. Relaxed low-rise, French-Mediterranean Condominium located near SM City Bicutan. Taste life’s simple pleasures with quality living at Chateau Elysée. Your charmed lifestyle unfolds in a secure community that allows you to play, bond, mingle, share and belong.